Pirate costumes are a perennial favorite—little boys love them, but so do the ladies and older gents. 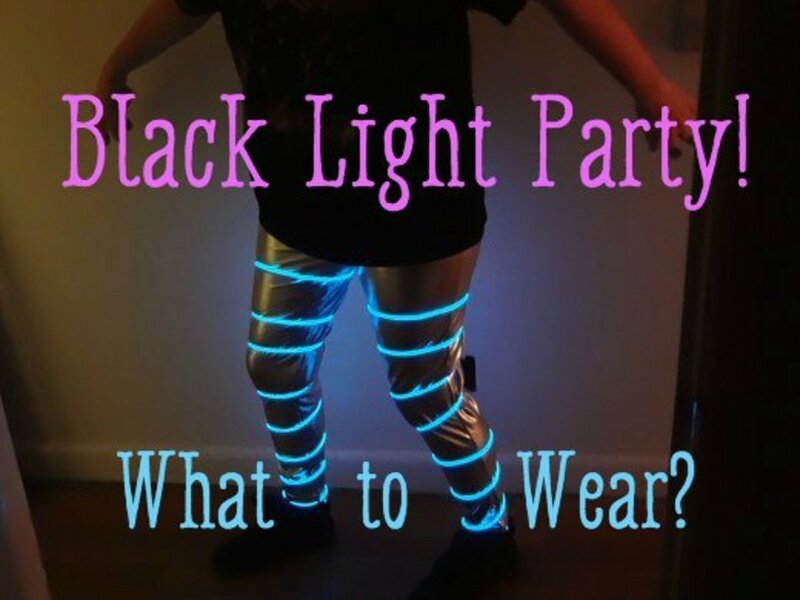 It's the perfect way to celebrate Halloween or show off at a local festival or event. 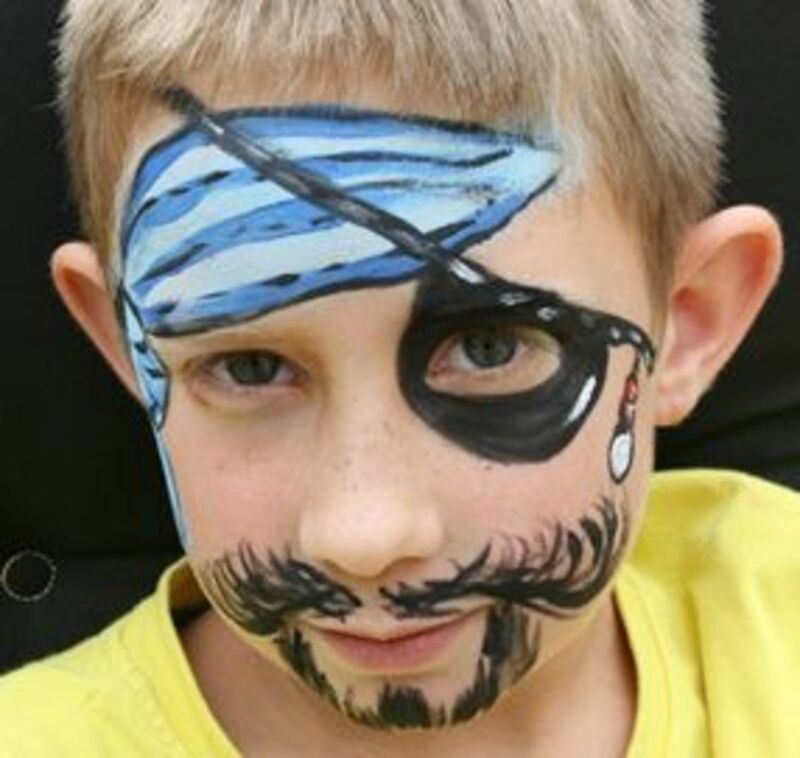 Face paint is a terrific way to create the appearance of a pirate. The Eyepatch: There must be an eye patch; what self-respecting pirate would go without one? The Facial Hair: Another necessary element is a mustache of some sort. The Bandanna: And to complete the look, there needs to be a bandanna wrapped across the forehead. Of course, there are endless variations of each of these features, allowing you to exercise your creativity. Once all of that is finished, a pirate hat can be added to make to make the costume really stand out. 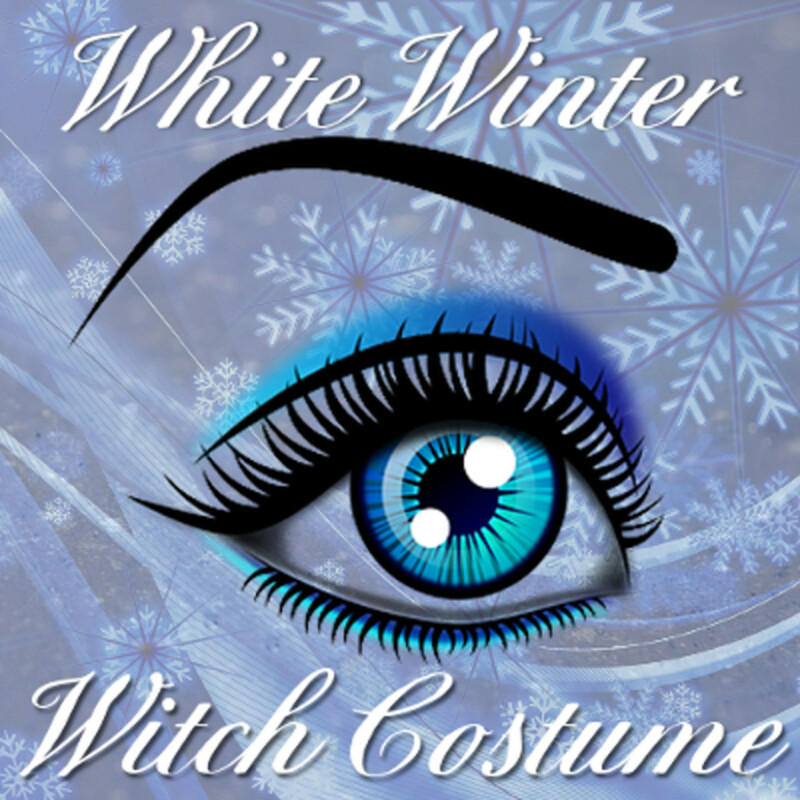 To really enhance the cool factor, especially for Halloween or a cosplay event, put together an entire outfit. 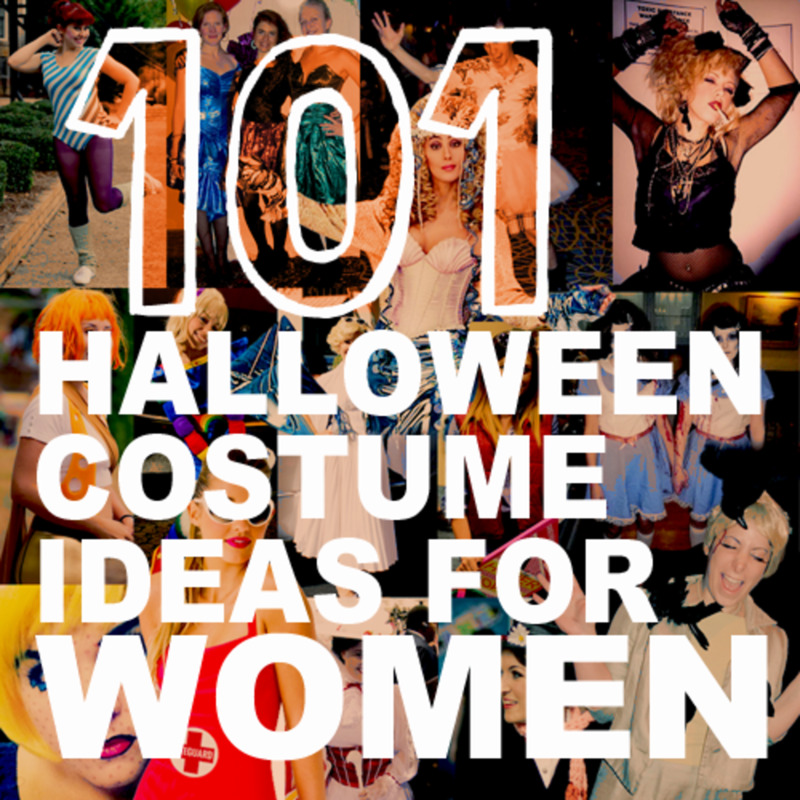 Some suggestions for pirate attire are a loose white shirt, a vest, and boots. 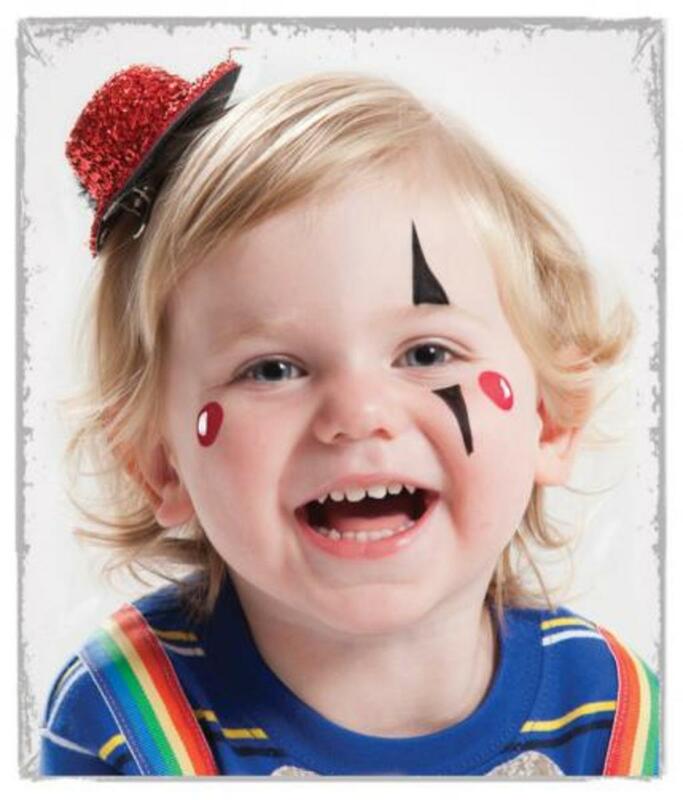 But it all starts with face painting—from there, the rest will fall into place. 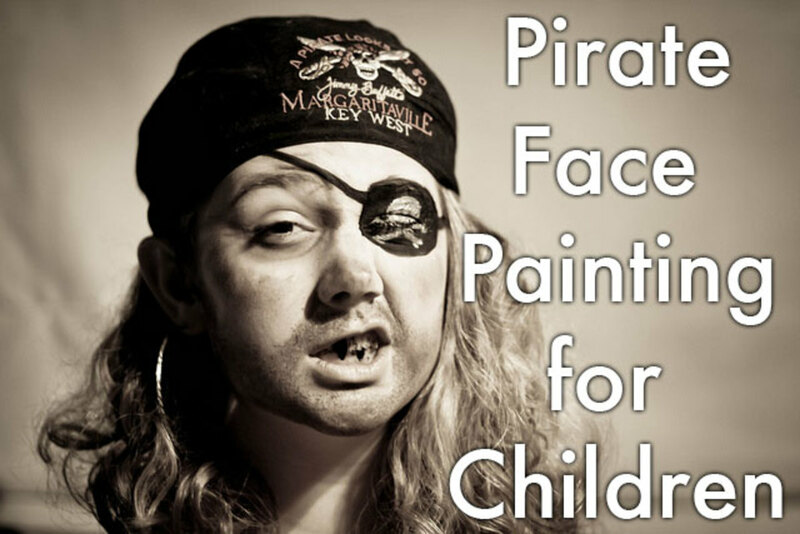 In this article, we'll look at some pirate face paintings and video tutorials. This first photo includes just about everything you would want to see for a pirate costume. But what this little boy has that most kids don't is a painted scar. Make a jagged red line for the fresh wound. Paint black "x" shapes to represent the hasty stitches sewn over the cut. At the tips of each "x," add a small red dot for the punctures where the thread is going into the skin. Another differentiating feature of the design is the simple pattern on the bandanna. The eyepatch is definitely a must for pirate wannabees. In this case, the paint completely covers the eye area. Some people leave a little unpainted space surrounding the eye for supposed safety reasons. It looks much better like this, as you'll see below, but paint only as close as you see fit. As for the placement of the patch, it's almost always done on the left eye, as you see here. On the face, we have a short stubble, which was really done nicely. To paint the stubble, use a stippling sponge. 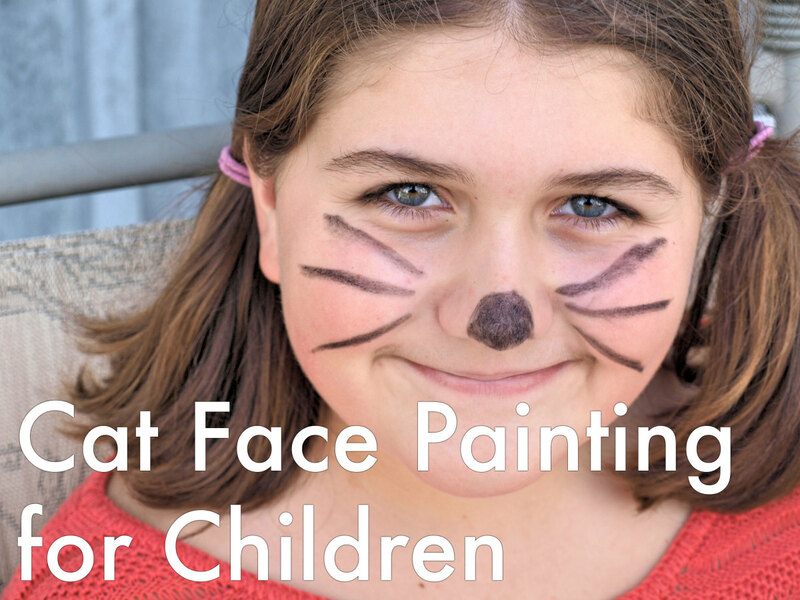 Dip the sponge in face paint and lightly dab it across the cheeks, upper lip, and lower jaw. You really get the sense that this little lad hasn't shaved for a few days. Here, you have a cool bandanna with polka dots. I usually think the bandanna looks best in red, although other colors are interesting as well, as you'll see below. 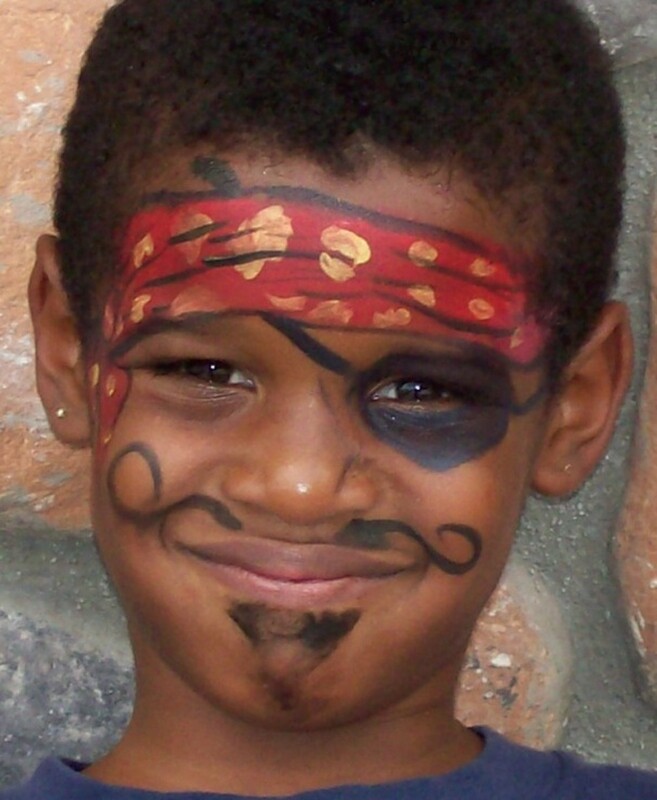 To show how different a pirate face painting can be on a child while incorporating similar design, here's one that shows a bandanna that has the same color and design, yet looks completely different. That's because the one painting the design added a more worn look through the choice of the red color, as well as adding the black lines to make it appear ruffled. It's really a great job. It makes the whole pirate look work for him. This eyepatch was done with an attention to detail—you will see that it does not end at the bandanna but continues on the other side. The idea of a goatee was a great one. However, it seems the artist focused primarily on making the bandanna awesome, while quickly painting in the mustache and goatee as afterthoughts. Too bad it was done so quickly, as it didn't quite capture the idea's full potential. But this little guy seems pleased, and, in the end, that's what matters. This is a great model to work from for a more realistic bandanna. This is the final look at a pirate with a red bandanna. I wanted to include several versions because, as I stated, I believe red bandannas stand out the best. What's different about this one is the shape, which appears to be tied off on the side of the face. That really adds a nice touch to the look of the pirate. This eyepatch actually goes over the bandanna. However, painting the strap underneath the bandanna, as the artist did in the previous example, may make more sense—it's likely that a pirate would always be wearing his or her eyepatch, so the bandanna would be tied on top. Here, the curled mustache is combined with the stubble. This bandanna is tied off to the side, and is patterned in what appears to be polka dots and paisley. Paint the scar, as it adds a little of the ominous side of a real pirate to the costume by displaying the consequences of the life he lived. Of course, if you want your pirate to wear a bandanna of a different color, you can easily change the red paint. Go with the top photo for the eye patch, as the dark black color used painted closely to the eye really stands out nicely. Create facial hair similar to that on the face in the lower picture, but strive to make the stubble a similar consistency to that in the photo on top. Use the red hue of the middle child for the bandanna, adding white dots over the red. Have the side of the bandanna hanging down and tied in a knot, the way seen in the bottom picture. Add lines similar to those in the middle photo to give the bandanna a more realistic look. You now have a fantastic bandanna for your little pirate. In this costume, we get our first look at a little pirate’s bandanna that isn't red with white dots. The eyepatch jewelry and the lines used for the facial hair make this costume stand out for me. Although the mustache and beard don’t suit my particular tastes, it is interesting to see how different facial hair looks on a little pirate. What stands out uniquely for me, in contrast to some of the other pirate faces, is the piece that is holding the eye patch on. It's more than just a line as the other artists used, as it has a bit of design—instead of string, the alternating black and white colors make the strap look as though it is made of cord or braid. Also interesting is the piece of pirate jewelry hanging off to the side. That's something I though I would see more of, but I'm sure many moms didn't want to include that in the design on their boys. The facial hair uses thick, expressive lines for a long wavy mustache and a shorter beard. Although red is my favorite, this doesn't look bad at all and is something to consider if you like the color combination of blue and white. The tied end on the side looks really nice. 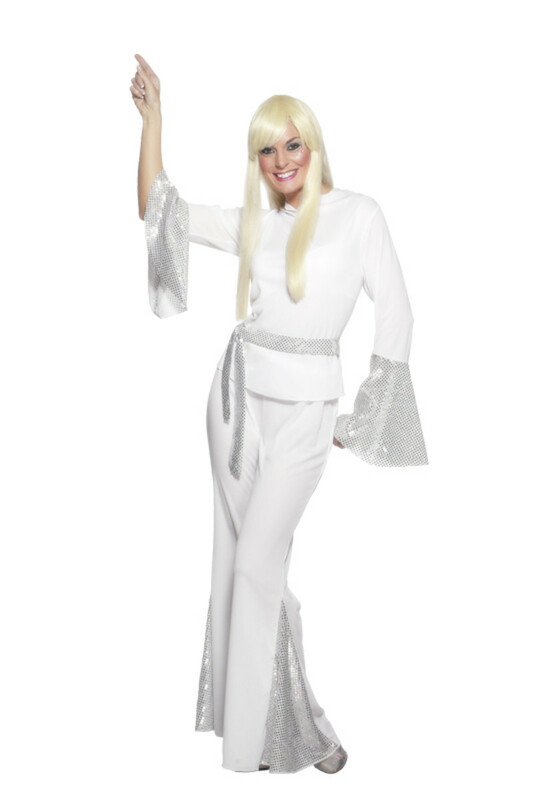 This is a costume with an unusual bandana color. Also of interest is the unique way the right eyebrow was blackened. That's something to consider for a different pirate look. This is one of those eye patches that was done with a little bit of the eye showing, probably for perceived safety reasons. The beard stubble looks pretty good, but remember to wipe off the lips once it's in place, as you can see wasn't done in the photo. 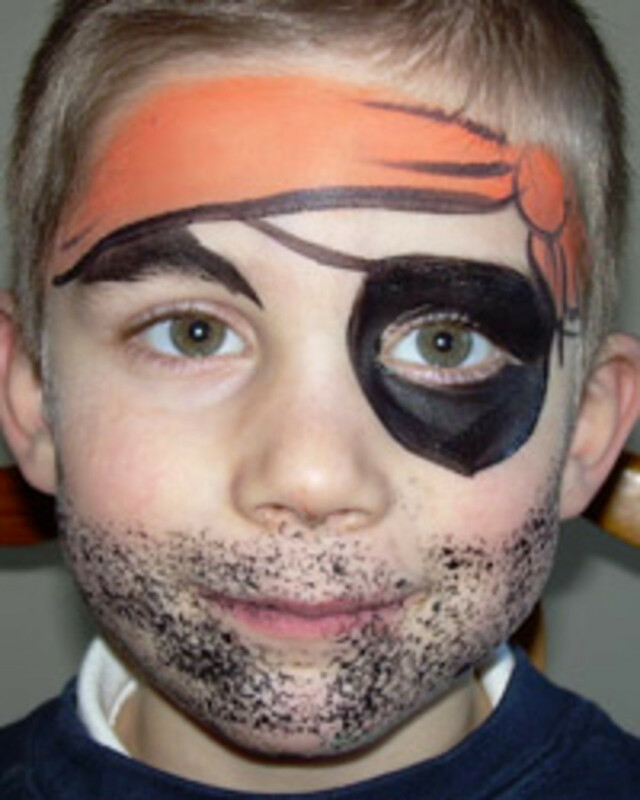 Here we have a pirate face painting with a different color bandanna, this time, orange. I like the more easily seen tied part of the bandanna on the forehead. All you have to do to create the creased look is add a couple of lines near the knot as you see below. 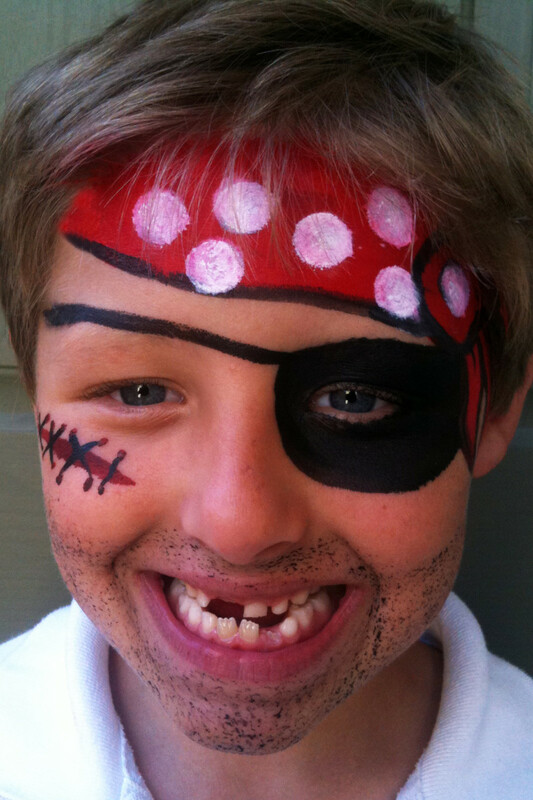 I wanted to complete this look at face painting pirates by including a photo of how it looks with a pirate hat. It really adds a completely different look and feel, and it would work with a painted on bandanna as well, as you could see it protruding out from under the rim of the hat. Here we also have the inclusion of an earring most of us associate with a pirate. It doesn't look bad or out of place at all in this case. Another unusual addition to this pirate face is the way the eye patch is portrayed, with the band being seen across the cheek rather than the side of the face and the forehead. In terms of facial hair, not only has a mustache and stubble been painted on, but bushy eyebrows to match. As previously mentioned, although this costume has a hat, it could still use a bandanna. Next we have a set of video tutorials showing how to create and design a pirate face for a child. 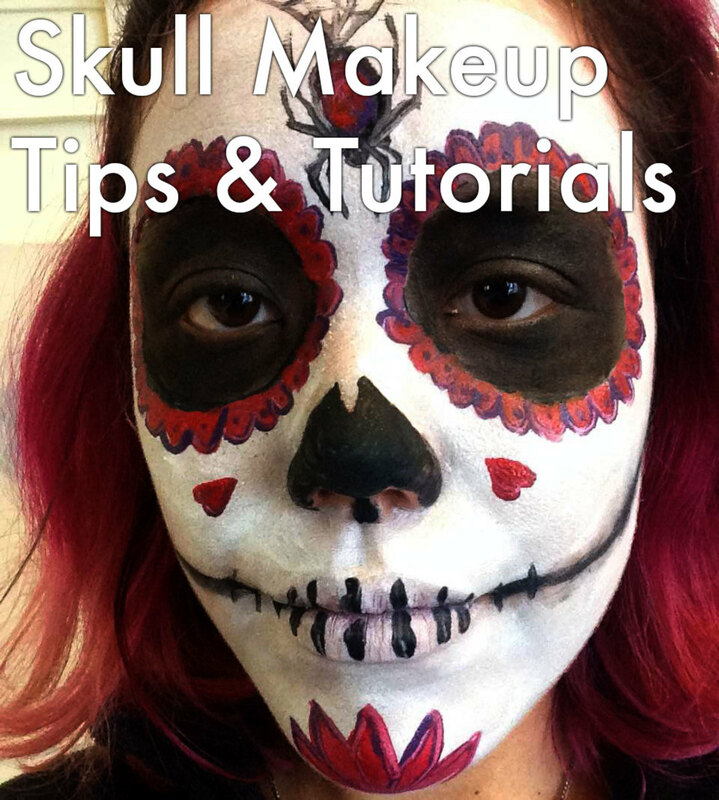 The first is noteworthy, because it teaches how to make a skull-and-crossbones tattoo. And if you are feeling ambitious, “Face-Painting Tips from the Pirates League” will teach you how to paint a black eye. All of these could be copied exactly, but the best use of the videos is to get general ideas and techniques, then combine your favorite aspects and maybe add a few creative touches of your own. Either way, you'll get some ideas you can use to make up your little pirate. 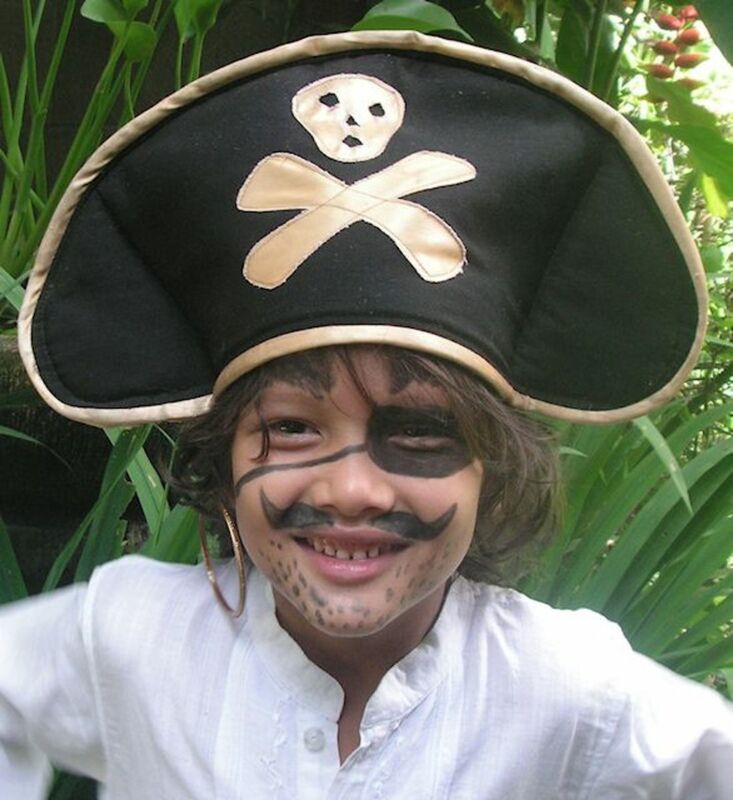 Well there you have a look at what your child could look like wearing a pirate face at Halloween or a special event. The whole idea, as mentioned earlier, is to look at the specific elements you like in each pirate face, and from there design your own, or better yet, ask your child which things they like the best and include them in the design. 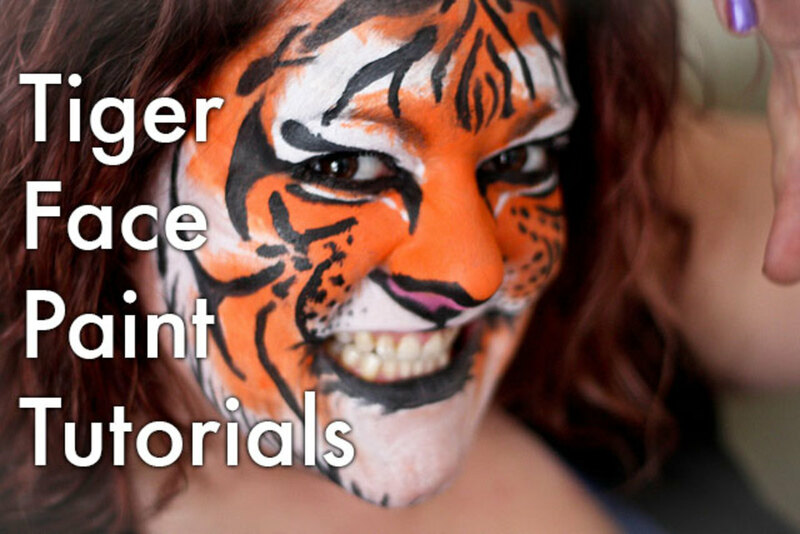 Looking at the video tutorials on how to face paint a pirate mask on your child will also give you more ideas on how to get the job done well. 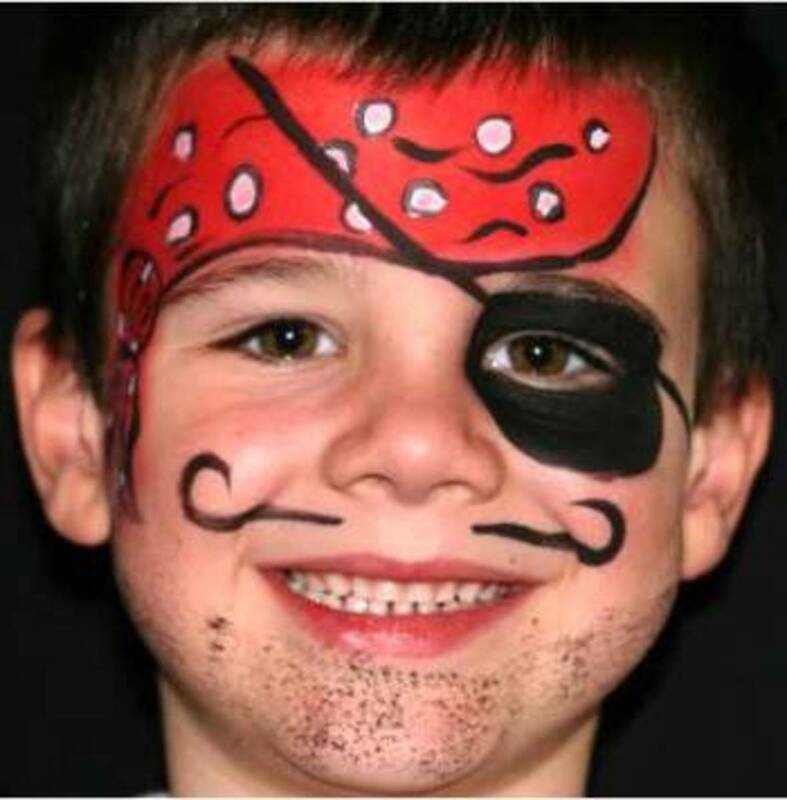 However you do it, face painting a pirate on your child or children will delight them, as it's a highly popular theme right now, and one that really never goes away in popularity. Add a couple of accessories and a pirate hat and your little swashbuckler will be made very happy and appreciative of your efforts.